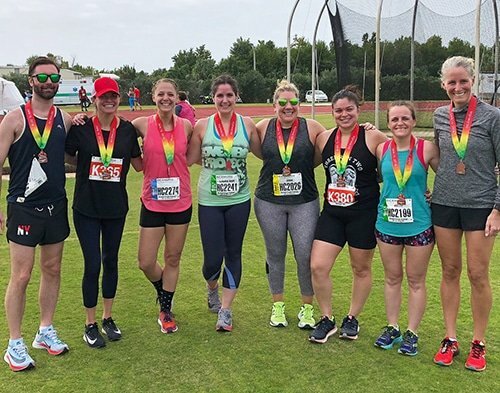 Back in August, my friend Erin (“Feeney,” from this point on — she’s the one I’m always hugging at finish lines) sent an email to a handful of friends, myself included. 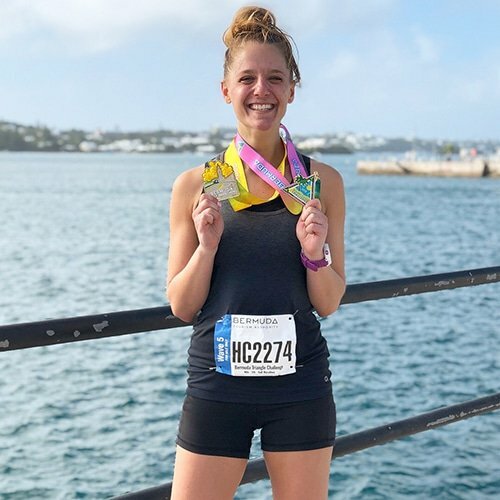 And then, in just two sentences, she sold the entire group on booking a trip to Bermuda in January to run the Bermuda Triangle Challenge races. Within an hour, everyone was in. Except me. A weekend getaway sounded good. Being warm sounded great. Spending time with the friends I’d neglected IRL while I was sick sounded necessary. And running a race or two sounded super fun. 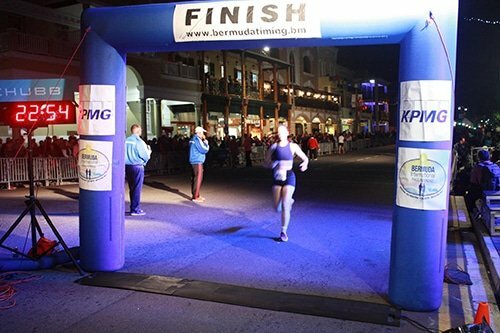 The Bermuda Triangle Challenge consists of three races: a mile Friday night, a 10K Saturday morning, and your choice of a half marathon or marathon on Sunday. Post-10K with our cute crew! I haven’t been running outside much, but I’ve been going to Orangetheory regularly. 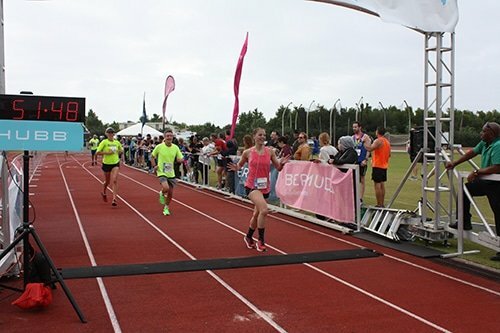 All I wanted to do was race the mile, and to race it all-out, but the mile is only open to Challenge participants, so I said, “YOLO, I’ll sign up for the Challenge.” I figured I’d go all-in on the mile, would run the 10K for fun, and would probably sit out the half marathon since the last time I ran double-digit miles was back in May, at the not-so-successful Brooklyn Half. But in the end, I ran all three races, and they were all awesome. Bib pickup! We wore the same bib for each race. Mine was in pretty rough shape by day three. Came home with four shiny new medals to add to the collection. Cool! Here’s how each race went down. 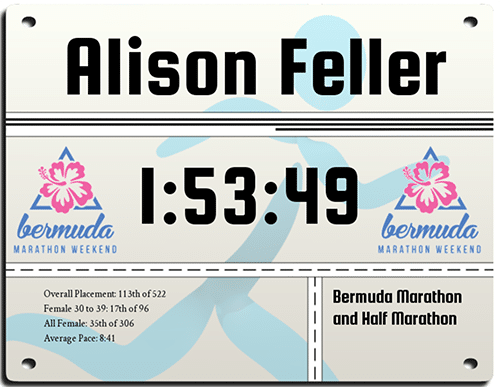 The goal: I wanted to run sub-6:30. I know that’s a totally unreasonable goal. I have only ever raced a mile once, when I was in solid marathon-training-shape before getting sick in 2016. 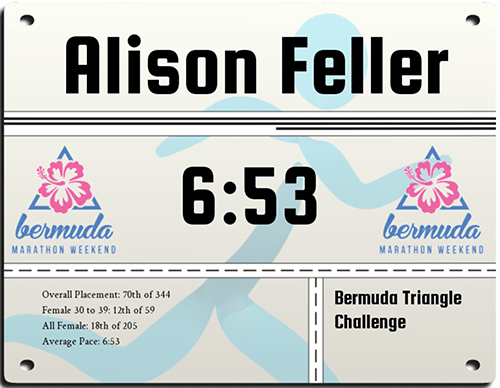 That course was flat, I ran near a pace group, and it was a straight shot on a hot but not at all windy day. The conditions were great, and I worked hard for that 6:23. So I don’t know why I had this goal in my head this time around. Even when I run at Orangetheory, I rarely run at a 6:30 pace, especially not for more than 30 seconds at a time. So this goal was…silly? Insane? Totally random? But why not have silly, insane, random goals?! 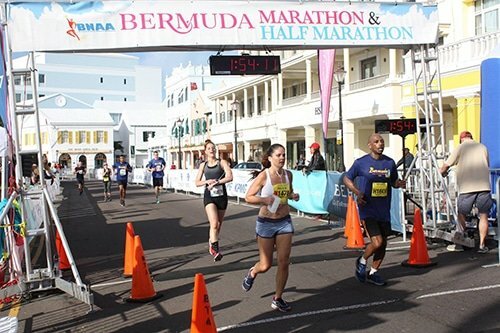 The course: We ran along Front Street, which is the main cute-and-bustling street downtown. There were five waves (and they were not assigned by pace — they seemed as random as my 6:30 goal), each going off at four-minute intervals, and I was in the last one. There are two 180-degree turns on the course, which makes it tough, and there’s a slight incline. Plus, it was super windy, and naturally the headwind hit during the uphill portion of the course. How I felt: Constipated! I was constipated for the majority of this trip, TBH. Why does this happen when I travel? Does my body just know I’m traveling so it decides to go wild? But other than that, I felt strong and happy. I really did think I was booking it. I looked at my watch within the first .1 miles and I think I saw an even 6:00 pace (it was dark, and I looked quickly, IDK), and that was the last time I looked at it until I crossed the finish. If anything, I thought I sped up, and I was pretty surprised when I stopped my watch and saw a slower time than I expected or was hoping for. But I still loved it! Racing a mile is so fun. This is my official finish photo… I’m glad it was free. The goal: To finish and to have fun. 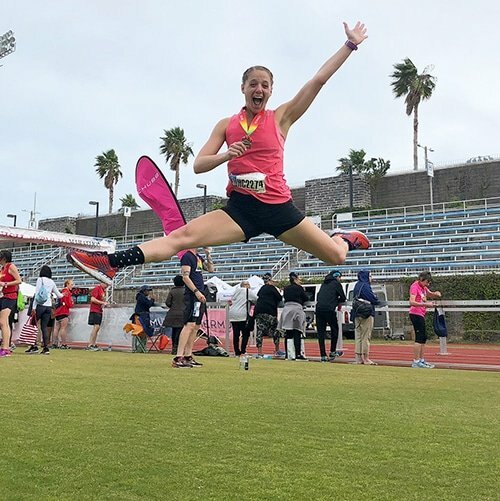 I used to be so competitive with myself that I would never run races “for fun.” I almost always have fun when I run, or at least set out with the intention to do so, but racing was for racing, in my mind. Oh how the turn tables have turned. (Who gets that reference? Who’s still reading this lengthy recap?) 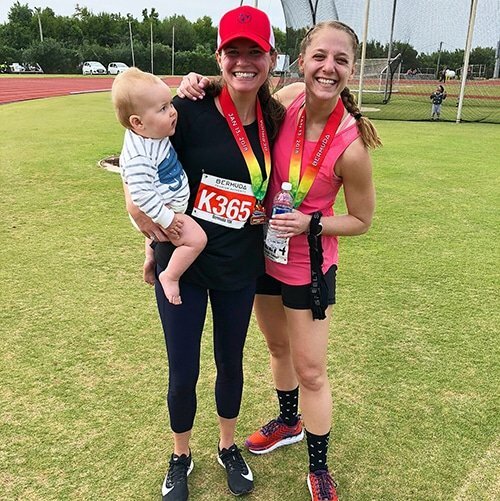 I was very excited when my friend Grace mentioned running together, because I knew that then, even if I started to hurt physically, I’d be with her and we’d make it fun. And it was so fun! Grace was the best running buddy, and she kept me moving on all those hills. This is Grace! And her youngest son, Oscar! She was back in Mom Mode within 3 seconds of crossing that finish line. The course: So hilly. It was also hot, but overcast, so at least the sun wasn’t beating down on us. 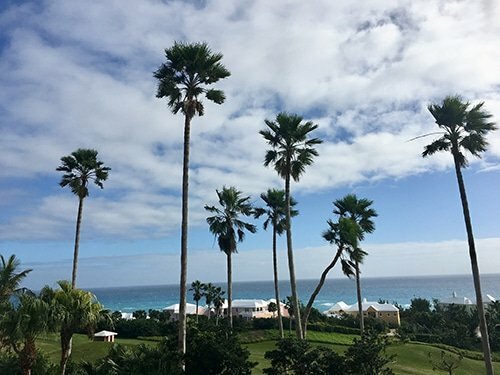 It was, however, very humid. I was drenched in sweat before we even saw the first mile marker. The 10K starts and finishes in a stadium, which I loved. How I felt: Still constipated! But I didn’t make any bathroom stops! That is a big deal! I was nervous about my stomach because it hadn’t seen much action, despite staying very hydrated and dropping into child’s pose every hour, but I had no issues during the race. I remember seeing a porta-potty around mile 3.5 and telling Grace, “There’s a porta-potty!” (My most-used running commentary.) But we kept running. I didn’t need it! As for pacing, I have no clue. I definitely ran faster than I would have if I were running alone, but Grace is quick and I was able to keep up until the last hill, so that was cool. Jazz hands. Never intentional, always present. The goal: To not run it! I knew I had no business running a half marathon. I hadn’t run quality miles in almost a year. I knew that if I ran it, especially if I ran it even remotely hard, I could risk injury, and that’s the last thing I need right now. So as always, do as I say I’m going to do, not as I actually sometimes do. But in the spirit of being healthy and saying yes to fun things, I lined up at the start with the intention of having another fun run. The course: Not as hilly as the 10K. Still very humid. Very hot. Slightly less windy. There was a huge hill right before mile four that just about killed me, and I remember seeing a big church at the top of the hill and thinking, “THANK YOU, JESUS, I HAVE ARRIVED, GOD BLESS US EVERYONE.” I’m really religious. The rest of the hills were rolling hills, and I love rolling hills. I especially enjoyed all the downhills. How I felt: So good! I felt surprisingly great for the first six miles. After six miles, I started to realize, “I haven’t really run this far in a while.” But mile 10, I told myself I was “so over distance running.” And I still stand by that. Things just felt tough, like I’d been pounding my body into the ground for 90 minutes and still had almost 30 to go. (Add the fact that I got the worst, biggest blister of my entire life on the left arch of my foot, and I’m about ready to swear off anything longer than 3.1 miles forever.) 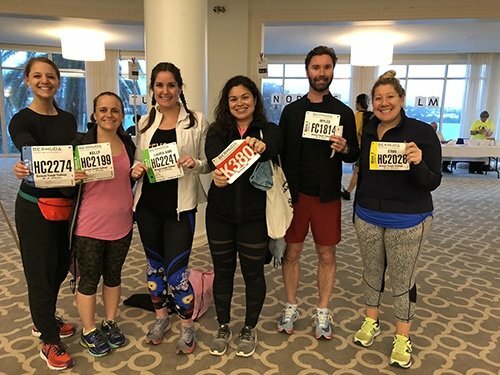 I stayed super strong mentally the entire time, though, and even when I started to get tired (hello, mile 11), I kept thinking about how lucky I felt to even be out running. Awwww. THREE DOWN, NONE TO GO! And then we all jumped in the ocean, which was the best part of the whole weekend. 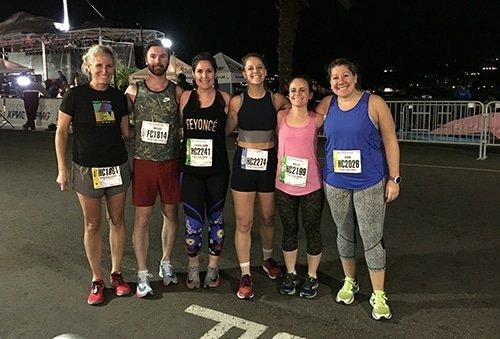 I ran three races in three days. I made zero bathroom stops the entire time. The last time I ran 13.1 miles without making any stops was in 2016. That is a big deal. Oh look. A jump shot. So far, so good, 2018. Keep that up. 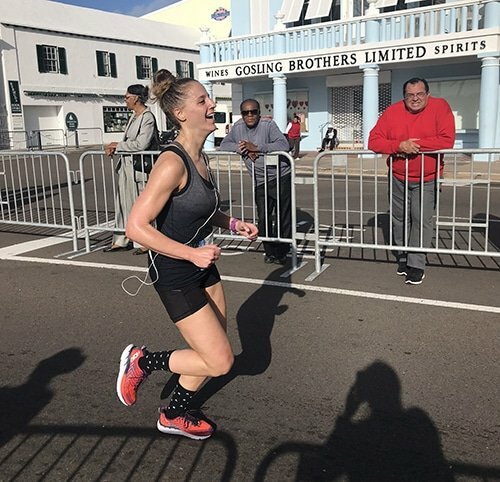 8 Responses to "Bermuda Triangle Challenge 2018 Recap"
So happy for you being healthy!! Yay! This makes me so happy!! And ready to find some friends who will do fun things like this. 😉 To think, you wouldn’t have gotten to do any of these things except for your awesome “what the hell I’ll try it and see what happens” attitude. Lastly, can you give me lessons on how to jump like that? You are the coolest, Ali. How awesome. Glad it was perfect for you. That looked so much fun! You nailed those times too!